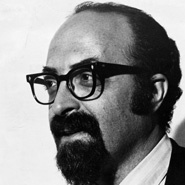 Chaim Potok first made his mark on the literary world with his 1967 novel The Chosen, which explored the conflicts of Orthodox Jews as they encountered the modern world. The bestseller went on to become a movie, which took the top award at the 1981 World Film Festival in Montreal. Potok tackled a similar theme in later novels, including My Name Is Asher Lev (1972) and In the Beginning (1975). From 1964 to 1975, he edited the journal Conservative Judaism, and he also served as editor-in-chief of the Jewish Publication Society (JPS) in Philadelphia. Under his guidance, JPS established a series of Bible commentaries and expanded its publication of children's literature.